The manufacturing of plastic bottles is painful to the environment - fumes and waste from making all that plastic - as well as a petroleum hog. Estimates for the oil consumed to make the plastic water bottles, just for America alone, is between 15-17 million barrels a year. "It would be like filling up a quarter of every (water) bottle with oil," says Peter Gleik, a water policy expert and director at the Oakland, Calif.-based Pacific Institute, which studies real life solutions to water crises. 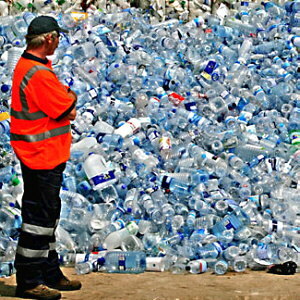 The water bottle industry uses 1.5 million tons of plastic. Truly disturbing is that 77% of those bottles are not recycled and so wind up in overcrowded landfills. Use reusable stainless steel bottles instead. You may still need to pick up a bottle of water here and there, but if you can start refilling a stainless steel bottle, especially for the gym, on your desk or at home, it will contribute to a cleaner environment for all. I haven't even mentioned how much money you can save. A stainless steel bottle costs about $10 - once. Consider what you pay for water - both monetarily and environmentally. We have a water purifying system in our shop and home. These systems are very inexpensive, produce great tasting water, eliminate the need for water delivery (all those bottles have to make it to the store somehow) and make the use of our stainless steel water bottles very practical.